TAG Heuer watches are known around the world for superior quality. 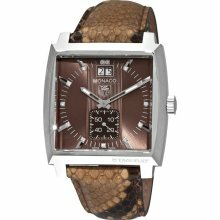 The TAG Heuer Men’s Monaco Black Stainless Steel Watch WW2110.FT6005 reflects the quality inherent in a luxury men’s watch. The sleek style of the watch starts with the square design of the stainless steel watch case. Measuring 37 mm in diameter, it isn’t as bulky as some of the men’s watches that overwhelm the wrist. Instead, it perfectly complements the sturdy black wrist band, for a sculpted look and finish. The black dial nicely contrasts the silver hour and minute markers, which are batons instead of numerals, adding to the sleek and elegant look. The dial also features a clear TAG Heuer emblem beneath the 12 o’clock marker. At the 3 o’clock marker, there is a date function, and above the 6 o’clock marker, there is a small seconds dial. All of these accents add to the functionality of the watch and the intricacy of the dial design. A possible drawback to this watch is the rubber wrist band. While this may be ideal for sportier gentlemen, it may be less than ideal for some wearers. Luckily, the same case and dial are available with a black leather strap (WW2110.FC6177). Sometimes these watches are listed as ladies’ watches, sometimes they are listed as men’s watches, and sometimes they are listed as unisex watches. The size of the case, however, would look very large on a woman’s wrist, and the designs are very masculine overall. The TAG Heuer watch with the rubber strap is available at several online retailers. Jomashop.com offers the lowest overall price at $2,170. Amazon.com may have a used version of the watch available for as low a price as $1,750. This is almost half the suggested retail price of $3,300. A Google product search will provide several other online retailers. The leather strap model also has a suggested retail price of $3,300, but it is available at bestinwatches.com for $1,500. 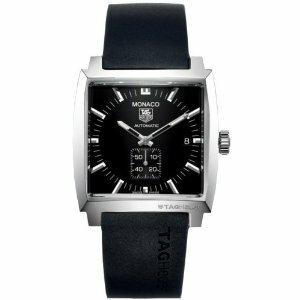 This watch is as classy and refined as any bearing the TAG Heuer name should be. It provides essential functions as well as announces to the world the impeccable taste of its gentleman owner.